Set in the coldest North Canada, White Fang is the story of a wild little wolf cub, White Fang, borne of a wolf and a female wolf-dog. The story of a wild animal who grows up near and in the company of man. The effect this has on him, and what it says about life, death, nature and nurture is what the book is all about. It is the companion book of The Call of the Wild, apparently its mirror. "It is not the way of the Wild to like movement. Life is an offence to it, for Life is movement; and the Wild aims always to destroy movement. It freezes the water to prevent it running to the sea; it drives the sap out of the trees till they are frozen to their mighty hearts; and most ferociously and terribly of all does the Wild harry and crush into submission man - man who is the most restless of life, ever in revolt against the dictum that all movement must in the end come to the cessation of movement." "Life flowed past him, deep and wide and varied, continually impinging upon his senses, demanding of him instant adjustments and correspondences, and compelling him, almost always, to suppress his natural impulses." I finished this book towards the end of last month. Since then, I have discussed it, if fleetingly, with more than a couple of people. The interactions have left me somewhat amused. One friend finds it eerie, to another it's the classic classic (I have yet to understand exactly what being a classic classic entails) while my favourite is perhaps the idea that it belongs to the same class of quiet reflective books as Walden (which, by the way, I haven't read.) I agree with each takeaway, while being carefully aware that that is not how I saw the book, at all: because I, for one, am most affected by the most literal of interpretations this book could have. This, I admit, is not the deepest essence of White Fang, but this is what the post shall deal with foremost - the evolution of the domestic dog. I am a cat person to the core. One of my favourite things about cats is that they are not so much domesticated as willing to share space with not entirely unlikable creatures (that would be us) so long as we serve their every need. A dog, in very stark contrast, lives to please. It is as if there is something inside a dog that exists only for the human caress. And, London says there is. London repeatedly talks about this feeling hidden deep within the wolf, White Fang, this call of the civilisation (let's put it like that) and its slow awakening with increasing contact with people. There is a very obvious analogy there with the savage man, of course, but the book significantly overtly captured my amateur (mostly experiential) interest in animal behaviour. Recently, a friend told me that the evolution of dogs was genetic. Very simply put, this meant that there was a certain genetic marker that made wolves afraid of humans, and a kind of wolf evolved in whom this hormone (I suppose) was absent - a forefather of our dog. Hours of swift-fingered Googling (the easiest research there is) led me to interesting tidbits - my friend was right, dogs were not tamed by us, really, but somehow "invented themselves" by becoming steadily tamer around and dependent on humans, in a surprisingly parasitic fashion. "There was something calling to him out there in the open. His mother heard it, too. The stream, the lair, and the quiet woods were calling to him, and he wanted her to come. But she heard also that other and louder call, the call of the fire and of man - the call which it has been given alone of all animals to the wolf to answer." Dogs and men have a special relationship, no doubt. And this book just gets it, from an utterly un-romanticized dog's perspective. The cruelty suffered by White Fang and the building of trust that forms the basis of any dog-human relationship is beautifully expressed. I read on Wikipedia that London suffered criticism for his "fake nature" writing and for overly anthropomorphic animals. I find this accusation ludicrous! The opposite is true. I loved how, throughout the book, London reaffirms that White Fang, the wolf, had no conscious clue of his nature or intentions, that it was plain instinct that guided his every move. Yes, White Fang is about life and experience, or often lack thereof. It is so many things, layer beneath layer of story. A fable about a lone pup in search of warmth and love. It is about coming of age. About the pull of the unknown and the loss of innocence that comes of it. White Fang is about reconciling with the wild in us, the savage that lurks in the belly of every civilization. The book humbles you in the face of nature, like The Lord of the Flies, and makes you question your firmest beliefs. It is also, quite unlike The Lord of the Flies, immensely reassuring. A book of quiet reflection, it will give you plenty to mull over. It is also supremely idiotic in how the white man makes a naturally superior god to the wolf than the tribal. I don't remember there being any memorable women among the humans in the book, but in the interest of not bristling at every turn, I do think that the mother wolf is one of the coolest female characters ever. Grade 5 of the school I teach at has an abridged chapter from this book in their English syllabus... The Grey Cub. It was this more than anything else that got me interested in Jack London - an author whom I have once, long ago, abandoned two pages in... (in a kiddy version of The Call of the Wild). I blame abridgment. Reading White Fang now, I kept wondering why we bother with abridged texts. Is it not a form of censorship?... taking it upon ourselves to decide what is and isn't appropriate for a certain age to read and experience. There is a lot, I realised as I read White Fang, that is lost in in this translation. The chapter from the Grade 5 book is mildly interesting, at best. It is simple and straightforward, where Jack London has poured multiple layers of meaning into every line, to peel back and marvel at. Look here - what is a mere "fall down a steep slope" in the textbook is originally this vivid gem of a line. Which child, tell me, won't chuckle at this? "Now the grey cub had lived all his days on a level floor. He had never experienced the hurt of a fall. He did not know what a wall was. So he stepped boldly out upon the air." And even if a book is deemed, rightly, as more appropriate for a certain age, then why distort it to suit another? Surely we have plenty of beautiful, profound children's literature to fill up all the textbooks in the world. Why bother with texts that need to be watered down when we have many available that cater to the very needs of the children? During my post-grad, I took up a course in teaching reading where we briefly dealt with how to edit texts for age-appropriateness: replace complex clauses with simple, use grade-level vocabulary and such. At the time, it never occurred to me simply ask; but why the hell just not stick to children's books instead! Thinking of the ones I have enjoyed over the years, I am not convinced they have any less to offer. Too long to read? 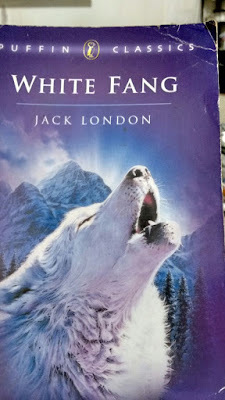 White Fang by Jack London - a must read, if ever there was one.